BANGI, 29 May 2014 – The Natrah riots in Singapore in 1952 had united the Malays to be resolute in upholding the dignity of Islam to the extent of questioning colonial rule. 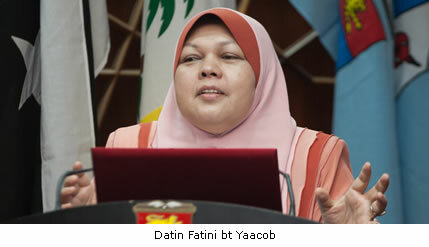 Writer of the biography of Natrah, Datin Fatini bt Yaacob said the uprising by the Malays in Singapore and the peninsula then was not a tragic loss for the people of Malaya as claimed by the British but had in fact planted the seeds of Malay nationalism against an insensitive and bias colonial rule. Fatini a Guest Writer at Universiti Teknologi Malaysia (UTM), related her experience researching for materials to write the biography of Natrah at a discourse on “The Natrah Riots: Implications towards Islam”. It was to discuss impact of the event on the Malays then and 64 years later on the young Malays of today. It was held at The National University of Malaysia (UKM) earlier this month. A former UKM lecturer and respected religious leader Nasharudin Mat Isa and Associate Prof Dr Jasri Jamal, from the Faculty of Law, UKM also took part in the discourse. Natrah, or her Dutch name Maria Bertha Hertogh, who was born on March 24, 1937, was given by her biological parents to a Malay family when they returned to Holland to escape from the Japanese during World War Two. She was then raised as a Muslim by her adoptive Malay family in Malaya. After the war her biological parents returned to Malaya and demanded that she be returned to them and filed a motion to the courts. Initially, Che Aminah, Natrah’s adoptive mother won custody of Natrah, but things quickly changed when it was revealed that Natrah, then 13 years old, was married to a 22 year old teacher Mansor Adabi. Dutch law provides that those under 16 cannot be married resulting in the court in Singapore ruling the wedding invalid and ordered Natrah to be returned to her biological parents and to be returned to the Netherlands. While in the Netherlands, Natrah left Islam and went back to her Christian roots, thus triggering anger of the Malays in Singapore and the Malay peninsular resulting in demonstrations and riots on the island on Dec 12 1950 where 18 people died and 200 others injured. Natrah later migrated to the United States of America (USA) in 1984 where she settled until her death at 72 of Leukaemia in 2009. Fatini explained that the riots that happened may be the reason why Natrah chose never to return to Islam. “She was 13 years old, locked up in church with other whites telling her that all the violence and unrest was due to her. That the people were fighting and dying for her and that it was her fault. “She was already confused by the court’s decision and had then to relearn to become a Christian. In her state of innocence she became even more scarred and disturbed,” Fatini said. When she interviewed Natrah in Lake Tahoe in United States, in 1989, she was then 52 and seemed a broken woman who had been in and out of psychiatric wards several times. “She was in an unstable emotional state and seemed very weary and tired. There was a fear in her, fear towards the Malays and Islam. A fear she could not explain or forget”. Fatini believed that Natrah was repeatedly told by her guardians that people were fighting, getting hurt and dying because of her actions of (converting to Islam and marrying a Muslim man without consent of her biological parents) to the extent that she ended up believing that the Malays viewed her as a traitor and wanted to hurt her. She lived with her confusion and emotional unrest for a very long time as to be very affected by it, Fatini said. The story is tragic and the court decision a travesty but the Malay uprising was not a tragedy. The Malays rose to uphold Islam and their dignity in the light of being labelled as lazy, good for nothing, worthless and spiritless by the British and to show that they would not just sit idly by when their religion was being insulted. Fatini said the Natrah tragedy was a turning point for the Malays and became the catalyst to fight for something that was worth more than just the life of a Dutch teenage girl. That was by standing up for their rights thereby sowing the seeds of independence in them. What had triggered them to act and rise up was the degrading attitude and insensitivity of the foreign media towards Islam. Pictures of Natrah praying in front of a statue of the Virgin Mary in a church on her knees and several write-ups ‘showing’ how happy Natrah was and ‘relieved’ to be a Christian again, had broken many sensitive barriers on Islam and had shown how the foreign media were rubbing in salt to an already agonising wound. The insensitivity of the media being insulting about Islam caused an outrage that was never seen by the British, from one of their more docile colonial lands, resulting in the riots of Dec 12th 1950. Nasharudin touching on the issue of youth, expressed his disappointment at the Malay youths of today who had inherited their freedom and rights from the struggles of their fathers. The struggle by the Malays then seemed to have been lost 64 years after Natrah, Nasharudin said. It was a different time back then when though there were some Malays who patronised night clubs and drink alcohol but when they heard what had happened to Natrah they joined in the demonstrations to uphold Islam because they knew it was their duty to do so. He lamented the loss of identity by the Muslim Malay youth of late to the point where they no longer cared or felt ashamed of their public behaviours. “We now see young Malays, especially in the Kuala Lumpur, wearing the skimpiest of dresses just like in America. We now have Malay youths who cannot even recite the simplest of doas. To all intent and purpose they are just like Natrah who had abandoned Islam. The only difference was that Natrah was forced to renounce Islam but these Malay youths seem to forget their religion on their own accord, Nasharudin said. The ensuing legacy that was left by Natrah’s case was that the Malay people took note of their religion and would always band together to defend it. In the aftermath of Natrah, it spurred on their fighting spirit that led to independence from British rule and to finally cement Islam’s well-being by making Islam the official religion of the country. Dr Jasri Jamal said there had been many great Malay Muslim leaders then who had made sacrifices to fight for Natrah’s rights of being and remaining a Muslim. They too had defended and fought for Islam and the rights of the Malays singling out the late Professor Emeritus Tan Sri Ahmad bin Mohamed Ibrahim, who was then the lawyer for Natrah. He said Tan Sri Ahmad is recognised as the leader of Islamic law in Malaysia and the father of the Malaysian Legal System. Dr Jasri mentioned figures such as Karim Ghani, Dr Burhanuddin al-Helmy and Tunku Abdul Rahman Putra Al-Haj, who had defended the sanctity of Islam so that when the country attained independence Islam was made the official religion. Malaysia, he said, is an Islamic State where Islamic laws are applicable to any Muslim. Agreeing with Nasharudin and Dr Jasri, Fatini also believed that the Malay Muslim youth of today had failed to impress with many of them becoming worse by not taking Islam seriously. Instead these youths are questioning Malay history, accusing the government of cover-ups and insulting their own Malay leaders who have sacrificed so much to free them from colonial rule. Even worse, there are those who questioned the words of the Al-Quran and try to re-write hadiths and Islamic values to suit their brand of equality and immorality, Fatini said. Nasharudin lamented the escalating number of Malay youths now more known for their demonstrations not for the cause of Islam but for someone else’s cause and to the detriment of Islam. They are fighting for religious equality that would affect the sanctity of Islam. They fight for LGBT’s right to be legal which is frowned upon by Islam. He described such actions not only embarrassing but frightening. The Natrah case is both a historical and moral story that must be told repeatedly to the youth of today so that they will remember their duty as Muslims and as the future leaders of the country. Nasharudin hoped the legacy that was left by Natrah would help to remind the Malay youth of how easy it is to fall from grace and go down a very dark path.